It’s basically gelatin that’s been made with the best flavor in the world. 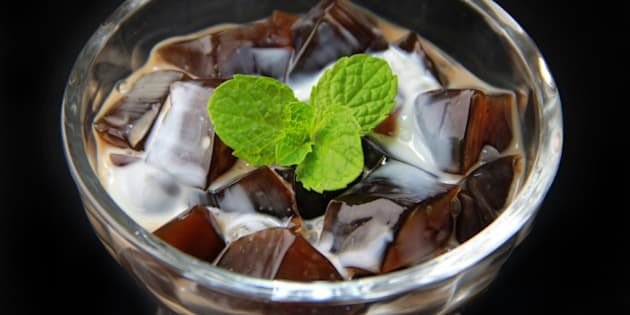 A recent Japanese Starbucks drink craze has brought an interesting dessert to our attention: coffee jelly. It’s basically gelatin that’s been made with the best flavor in the world. Jellies are big in Japanese food culture, so it comes as no real surprise that the Japanese would find a way to meld them with coffee. But coffee jelly is not unique to Japan. In fact, it dates back to 1817 England and it even had (and still has, to a small degree) enjoyed popularity in New England where it was referred to as coffee gelatin. FYI, you can recreate this insanity of the Starbucks version in your own home. We have the video for that, too.